When do I need to feed the Lakeside Avenue parking kiosks? Beginning on the Saturday before Memorial Day weekend, and ending on Columbus Day, kiosks are in effect daily, from 9am to 10pm. Parking costs $1 an hour, and can be purchased in 15 minute increments. There are 13 kiosks spread along the Avenue, and they accept either coins or cards. They do not accept bills. Remember your space number when you park, as you will need to enter your space number when you pay at the kiosk. A receipt is optional. You do NOT need to display your receipt on your dashboard. Depending on which space you are parked in, you can pay for up to 2, 3, or 5 hours at a time. Once a space is paid for, you cannot extend the parking time. You will have to start the time all over again (from zero) to gain additional parking time. There are 220 parking spaces on Lakeside Avenue. There are 211 regular parking spaces, 8 handicap spaces, and one loading space. Of the regular spaces, 70% (149) of them are 5-hour spaces; 18% (38) are 2-hour spaces; and 12% (24) are 3-hour spaces. Space numbering begins at the Weirs Beach arrow sign and runs to Foster Avenue. Parking spaces on the East (Lake) side of Lakeside Avenue are oddly numbered, starting with #101, and ending at #341. Parking spaces on the West (Buildings) side are evenly numbered, starting with #102, and ending at #298. (There are no-even numbered spaces between #300 and #340.) There are 168 angled parking spaces, and 52 parallel parking ones. When do I need to feed the parking meters? In 2017, the 220 public parking meters on Lakeside Avenue were replaced by the 13 parking kiosks. There remain about 20 private parking meter spaces. Be careful to feed these according to the signs, or your car may be towed! 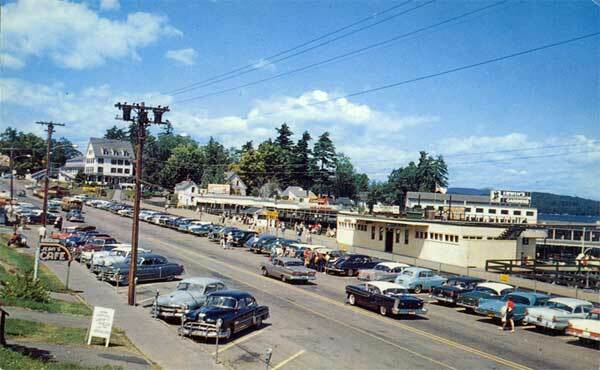 In this late 50’s photo (click here to SuperSize [750k]), in addition to the parking meters, one can see a sign for Jean’s Cafe to the left of the photo. Jean’s Cafe (named after its original owner, Jean Tehberg) was a small diner that had replaced the large, “3rd Regiment” Victorian that had been destroyed in the great Weirs Beach fire of 1924. Local businessman Sidney Ames leased the building from the NH Veterans Association from 1951 through about 1980. Every summer Chef Sandy Baroni would return from his winter job as a college cafeteria chef and serve up delicious Italian food; there was a mini-bar seating 4 persons and booth style seating complete with in-wall jukeboxes. Roughly a decade later, the Ames family re-entered the Italian restaurant business when, after purchasing the Winnipesaukee Marketplace building in 1991, they opened the Patio Garden Restaurant. The above image of the band stand is part of a larger photo. Click here to see the full photo, several more photos of the station, and a photo of a band playing on the rooftop.